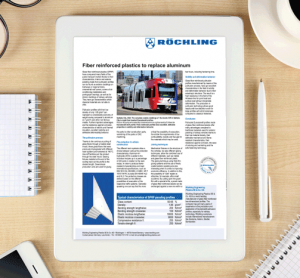 The Röchling Group, a globally operating plastics group with more than 8,500 employees at 77 locations in 22 countries, stands for proficiency in plastics. The Röchling name means innovative products and state-of-the-art technology in the processing of engineering plastics for a series of industrial applications. The Industrial division offers a broad product range of thermoplastics and composite materials. Röchling is a leading manufacturer of Durostone® standard and special composite profiles, especially for all applications within railway engineering e.g. cable and air conditioning ducts, hatch covers, interior and exterior panels and planks, window and door frame covers. The Automotive division provides car manufacturers all over the world with technologically superior plastics. The Medical division offers customers in the medical technology and the pharmaceutical industries injection-molded components and blow-molded primary packaging applications.